Welcome to another edition of Around the Town Thursday! 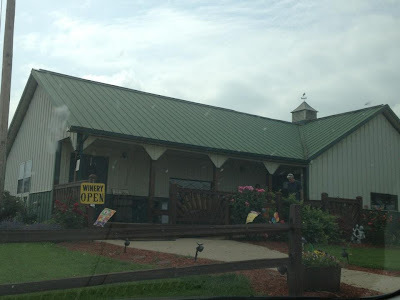 I’m a loud-and-proud-whino so I thought I might introduce you to one of my absolute most favorite places…Holy-Field Vineyard & Winery. A family-owned winery, Holy-Field is an award-winning winery located in Basehor, Kansas. According to their About Us page: “The vineyard is planted with Native American and French hybrid varieties with an emphasis placed on growing superior grapes.” I’ve been to their tasting room on several occasions and not only found their wines to be enjoyable and superior to other wines I’ve tried but their staff is friendly and helpful as well! I was recently introduced to their Late Harvest Vignoles at my bachelorette winery tour and I fell in love with it. Having just gotten back from a whirlwind one day winery tour of Niagara-on-the-Lake (a region famous for its ice wine, a must taste if you haven’t yet!) I can honestly say that it rivals some of those ice wines in taste. However, while ice wine is a late harvest wine, not every late harvest wine is ice wine. Hernder Estate Wines has an article entitled What is Icewine? that gives a good explanation of what ice wine is. Now, Holy-Field isn’t just a taste-and-go establishment. They have a beautiful deck and gazebo where you can enjoy the bottle of wine you’re sure to have purchased from their gift shop while visiting and overlook their vineyards while relaxing. They also have music events, dinner theater (which always sell out! ), Oktoberfest, and picking days (which you won’t want to miss). Most of their events are listed on their calendar of events. Whether you like red or white, sweet or dry, there’s a wine for everyone at Holy-Field and their prices are definitely reasonable. I have no doubt they’d love for everyone to stop in, say hi and give their wines a try. Personally, I can’t wait to go back! Poor D1, I’m sure he’ll cringe when he reads that last sentence since he recently discovered the…ahem, stash…of wine accumulated from my recent travels for work and the many local wineries I discovered during my bachelorette party winery tour. As tolerant as he is of my drive to find good, inexpensive, locally-made wines he’ll simply smile, pat me on the head and tell me not to buy too many bottles (probably while sipping on the hot pepper wine he happily bought in Oklahoma and Missouri, lol). Ah, but those are a story for another post (wink, wink).